Port Alberni, B.C. - Hammer's Bulldog Blog: More success with Alberni Valley Athletes in Kamloops...this time Wrestling. More success with Alberni Valley Athletes in Kamloops...this time Wrestling. Between the Midget Bulldogs winning their tournament, and the showing by Alberni Wrestling, I wonder if Kamloops will ever allow our athletes back? Way to go Alberni Wrestling! 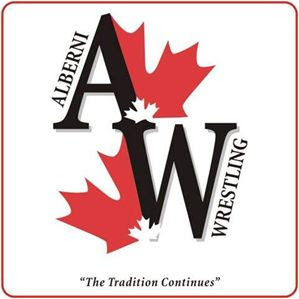 Alberni Wrestlers arrived home late Saturday night with a bus load of medals from the Western Canada Age Class in Kamloops. The annual age class event features over 800 wrestlers from all over western Canada in five different age groups for both boys and girls. A large contingent of local wrestlers from Neill and Dunn Middle schools and Alberni District Secondary made the trek to Kamloops along with their sister team from Ucluelet Secondary. Four Alberni wrestlers won their respective weight and age classes to bring home gold medals. The team was led, as they have been for the past year or more, by ADSS wrestlers Michael Cappus and Savannah Toth. Cappus was unbeatable in the very tough 69 kg Juvenile boys division (17-18 yr olds). He dominated many of his matches before defeating a very formidable Jag Basra of Abbotsford in the final. Teammate Cody McEvay also had a strong tournament at the heavier 69 kg weight and despite battling some hand injuries he placed fifth. The grade 11 Toth was also dominant in the 65 kg Juvenile girls division but she had to beat some very good opponents. After winning provincial and National titles last year the concern from her coaches was who would push Toth this year. The answer was found in her semi final match where Toth was being beaten by a wrestler new to BC from Carson Graham and had to come from behind to record the win and get to the final. Local coaches were also very proud of Cadet aged wrestlers (15-16 yr olds) Daley Forbes and Isaiah Taylor. In only her first year as a Cadet, grade 9 ADSS wrestler Forbes won the 69 kg girls weight class while the grade 10 ADSS wrestler Taylor won the 76 kg boys division. Forbes is proving to be the heir apparent to Toth on the girls side as she impresses everyone with her progress. In Kamloops she wrestled well to win her second Age Class gold medal. Last year she won the Schoolgirl division and was named the top female in that age group by BC Wrestling. Taylor continues his rise up the wrestling ranks with a strong performance in Kamloops. He had to earn his gold as he met a tough opponent from Hazelton in the final. The northern wrestler dominated Taylor in round one and round two ended in a tie forcing a clinch situation. After several controversial starts Taylor won that round to force a third and deciding round in which he dominated his opponent to win the weight. Taylor, like Forbes, will be potential seeds even at the high school level at the BC’s in afew weeks. Alberni wasn’t done with just gold medals. Five locals captured silver and four took bronze medals in their respective weights and ages. Senior Kyle Plaunt appears to be making a strong comeback after a subpar grade 11 year. Plaunt had a excellent tournament at 58 kg Juvenile and to place second. He was rewarded with his performance with some serious interest from the University of Calgary scout who was in Kamloops. Grade 10 teammate Brianne Charles was a silver medalist at 60 kg Cadet girls. She had an excellent tournament and has shown that she will compete against the best at any age. Charles is another of a strong group of young female wrestlers that will likely have ADSS in the top 3 this year and a contender for the provincial title in the next two years. Grade 10 up and comer Austin Evans won the bronze at 54 kg Cadet boys. Evans is one of the young ADSS crew that coach McDonald is so high on. In the younger School Age divisions for grade 6-8 middle school wrestlers Alberni also had some great performances. Neill’s Jordan Wagner and Cole Walton took silver in their respective 37 kg and 67 kg boys weights. Dunn’s Jordie Bodnar was a silver medalist at 41 kg in the girls division. Bronze medals were earned by Dunn’s Dakota Sutton (41 kg) and Cody Baumi (45 kg) and Neill’s Preston Antonelli (69 kg). Rhea Wing (36 kg) and Jesse Wagner (33 kg) of Neill both placed 5th in their divisions. The Age Class marks an important point in the school wrestling season as it and the Simon Fraser War on the Floor in December really set to rankings for the season leading up to the high school championships at the end of February. It appears at this stage that ADSS will continue to be ranked in the top 5 in both the Boys and Girls divisions a feat not accomplished by many teams. Local fans get a chance to see the local wrestlers compete this week when Dunn plays host to a junior and senior dual meet with Campbell River. The up Island contingent will travel to Alberni for a 4:30 pm match up against many of the local middle and secondary school wrestlers. In three weeks the big show is on as Alberni hosts their prestigious Alberni Invitational Wrestling Tournament February 5-7 at the Multiplex. Over 600 wrestlers are expected to descend on our community for what is widely considered one of the top school wrestling tournaments in Canada. Thanks to Tom McEvay for the update. Again, well done Alberni Wrestling.